For over 40 years, Guitar Player has stood out as one of the oldest and best guitarist magazine on the market as it goes beyond the mainstream views of the guitar and presents a broader and more comprehensive sense of the entire sphere of music that the guitar holds a special place in. 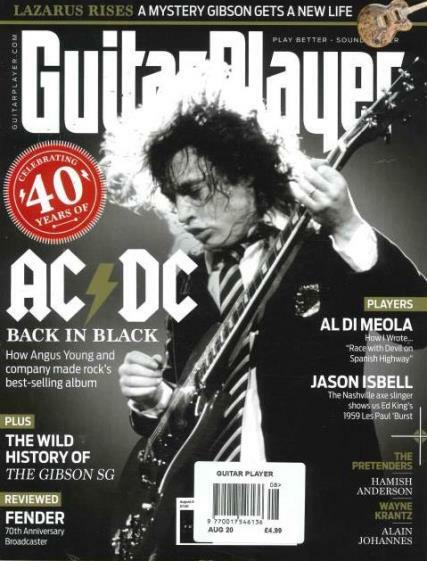 Buy a single copy or subscription to Guitar Player magazine. As a monthly magazine that has been on newsstands for the past 40 years, Guitar Player always has to innovate and create substantial and interesting articles to compete with the wealth of guitarist magazines out there, which many respected critics claim that this magazine does eloquently. Each issue features the latest tips, tricks, and techniques for guitar enthusiasts who are striving to improve their craft, but not only does these tips and techniques come from highly educated music teachers, but also from the best and most worldly renowned guitar players. In addition to these comprehensive and informative lessons in each issue, Guitar Player is one of the most trusted magazines when it comes to gear reviews. Whether it is old or new models of various guitar brands or amplifiers, microphones, and other technical gear, readers can be assured that they are given an unbiased and direct review of these products before readers buy them.